Bannon considers himself a leader of this movement and, unlike his new boss, Bannon is ideological to his core. He is driven to restore a Western world system and society based on Judeo-Christian values and a capitalist system that distributes more income to the white working class. In a 2014 speech, Bannon gave a rare public glimpse into the full range of his views during a conference at the Vatican. Bannon laid out his ideological vision to save the Western world. In Bannon’s view, capitalism is still the most viable economic system, but it has gone off the rails. Two separate strains of capitalism now dominate the West and must be realigned through revolutionary action. The first strain is a crony capitalism of insiders. This “state-controlled capitalism” is “the big thing the Tea party is fighting in the United States.” This capitalism is abhorrent to Bannon and echoes similar insights from the left, of an economic system controlled by the wealthy few who are served by a permanent political elite. These groups hoard wealth and disenfranchise the larger working class, more specifically for Bannon, the white working class. The other strain of capitalism that he opposes is what he calls “Ayn Rand or the objectivist school of libertarian capitalism.” Ayn Rand, a Russian-American writer, has become an important philosophical figure for right-wing libertarians in the United States. Rand put forth a philosophical view that rational self-interest is our true moral purpose in life and that laissez-faire capitalism, or unregulated capitalism, is the most capable system for humans to pursue our individual rights. Laissez-faire capitalism has long been embraced by right-wing think tanks and the modern Republican party. Bannon breaks with it as a doctrine because he believes it commodifies individuals into selfish actors. In Bannon’s view, people turn toward pursuing “personal freedom” as a way of life. This hedonism divorces people from a Christian belief system and that leads to a breakdown in society. For Bannon, an idealized view of capitalism would be the 1950’s America, where the wealth and income gap were not as cavernous as today. The family unit and the Christian-based gospel held people together. This is the nostalgic world Bannon would prefer to take us all back to. A place where others who were not white hid in the shadows. A time where people still engaged in behavior not sanctioned by the church or polite society, but at least they had the decency to keep it out of the public domain, not only because of the the fear of breaking social mores but also because of the risk of arrest. A time when Black people were more overtly controlled for the pleasure of white pleasure and ego. Bannon’s concern with restoring what he believes is being lost, the centralization of whiteness to politics and political discourse, is what drives him. Blacks and others are collateral damage to this restoration, both in the U.S. and in Europe. For Bannon, the disturbing racial animosity that is part and parcel of the Tea party is a side note and nonfactor as long as the greater good is achieved — the unifying of white people. As he states, “With all the baggage that those groups bring … we think that will all be worked through with time.” By baggage, he is speaking of their racial animus. Bannon has been more careful than other alt-right leaders in avoiding public expressions of racism. He instead provided them with a platform. When he says the racial baggage will be worked out, he means fewer immigrants in Europe and America and a return to complete white dominance over civil society. 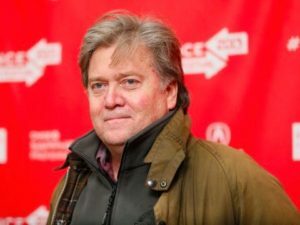 To save the Judeo-Christian world order, Bannon believes he has to galvanize a white populous through a white nationalist sentiment grounded in American history, thought and behavior. His publication has fostered dangerous stereotypes of “others” and a calling to arms of a white ethno-nationalist allegiance. Bannon is ok with sacrificing Black bodies to white anger if, in the long run, this white anger can become the basis for the revolution he wants. Internationally he sees Europe as being endangered by a fundamentalist Islam looking to crash upon its shores. Bannon sees his fundamentalism as the good fundamentalism. His view of European history is as a benign conqueror spreading the gospel of Christianity. He apparently does not see the seeds of Islamic fundamentalism in the struggle to remove Western imperialism and exploitation from its homelands. For Bannon, Western invaders always have a higher purpose of spreading a Christian god to the barbarians. Bannon will now have the best chance possible to forge his revolution. His position with the President-elect gives him access but not control. There will be an internal war in the Trump administration that will pit Trump’s crony and laissez-faire capitalist appointees against Bannon. Most of Trump’s Cabinet picks are like himself, from a billionaire class looking to add to its riches. This is something Bannon will see as a problem. Trump’s billionaire appointees will have no spiritual connection to their lower-class white Christians. They look to preserve the wealth gap. They are only ideologues to the collection of more money. Bannon has to know this. He knows that Trump is mostly non-ideological except he is a white-race man. That is where there will be common ground. Trump will want Bannon’s help in feeding the white masses the red meat they crave in dispensing with political correctness. Bannon will want more — a fundamental change in capitalism. A world where income and wealth are distributed more broadly and Christian morality is more than just pious lip service. The only thing this group truly agrees on is the subservience of Blacks and others to the master race, as they work out the rest.